Sanaz Ahari just sent me a Facebook message that Steve Rider has passed away, he died from pre-leukemia on June 5. He was diagnosed just a year ago. I interviewed him back when I was a Microsoft employee and he was doing incredible work, both back then and then at iLike.com. He was one of the most innovative people I met at Microsoft and was behind early live.com efforts. Add to last weekend’s tragic death of Rajeev Motwani, who was one of the early people involved in Google and a well respected Stanford Professor, and it just makes me sad. Today my work is dedicated to both of them. They both improved my life with their work, I wish I could come up to that bar that they’ve set with their all-to-young lives. This afternoon we turn the key on Building43. I’m up at 5 a.m. to help the team put the finishing touches on the site, and thought it would be a good place to start my blog back up. Sorry for disappearing from my long-form blog for a while. I just didn’t have the energy to write more than 140 characters or so. That’s one reason why I like my friendfeed page or my Twitter account, which I often treat like a blog but I can do it in little chunks in between doing other tasks. Sort of a treat while doing other things. But first, what is building43? 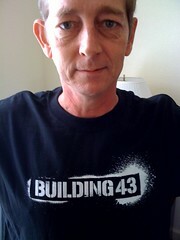 Building43 a Web site. It’s a T-shirt. It’s a Twitter account. It is a video channel on Blip.tv. It’s a friendfeed group. It’s a sticker. It’s a team. It’s a Facebook Page. It’s a database (or really a few of them). And more. It’s a community for people who are fanatical about the Internet. It’s an interview with Mark Zuckerberg, Facebook’s founder and CEO, where he gives his dad, who is a dentist, some ideas for how to use the new web to do business better (I call it the 2010 Web, Kara Swisher calls it Web 3.0, yet other people just want to call it “the web.” I don’t care what you call it as you recognize that there’s a different web today and it doesn’t look like the Web that was around in 1994). Or, it’s a community of hundreds of people who will be at TechCrunch’s headquarters this afternoon to help us ship this. Coming this afternoon are some remarkable people who have done remarkable things with their lives, and that’s totally humbling. This is also one of the first times in recent memory where I wasn’t transparent. Turns out that while I was traveling, speaking, interviewing, helping build a team, arguing about what we were doing, researching, talking, listening, etc it’s very hard to blog. Who knew? Heheh. But it all started three months ago when Rocky Barbanica and I visited with a bunch of executives at Rackspace for a few days. What was my first week at work like? Well, the Chairman, Graham Weston, walked us around to many of the employees at Rackspace, and introduced us. A year ago I got to interview Graham and came home and declared that Rackspace was the best company I’d ever studied and that Weston was a “real business leader.” Now I got to see it from the inside. I’ve never heard of a chairman of a public company doing this: introducing a new hire to the company personally. It was an experience I’ll never forget. I have some of the video and it’s so personal that I haven’t even shown it to other Rackers (people who work at Rackspace are called “Rackers”). Graham knows, it seems, everyone in the company and can tell you something about them and you can tell when they both meet that they both have a lot of respect for each other. It’s something I haven’t seen in corporate life for a while. Anyway, we talked in those days about why Rackspace hired us. Turns out that Graham saw a creative spark between Rocky and me that he appreciated and wondered if he could find a way to foster. I think he missed that we’re always pretty close to going postal on each other, but that’s does get a certain kind of creativity out of me. Heheh. But now I need to bring Rob La Gesse into the picture. I think the first time I had a real conversation with Rob was a couple of years ago when Maryam and I were moving back down to California from Seattle. We were driving and I Twittered to please call me cause I was bored. Well, he called me about an hour later and that led to him building a friendship with me and he was the one responsible for getting me to San Antonio to meet the startups in town. Back then he wasn’t a Rackspace employee, he was a contractor and he thought that by bringing me to town it would help his ability to get work. Little did he know. Today he’s at Rackspace and he’s our boss. Interesting how it all started on Twitter three summers ago. Anyway, I’m rambling. In about 12 hours you’re going to get to see what we’ve done. It is just the start. To the trained eye it looks like a WordPress blog and a friendfeed group (and soon a Facebook page and a Twitter account). But we just needed to ship. And ship fast without a dedicated technology team. Shipping is a feature, my old friends at Microsoft used to say. Why is that? Well, because of where we’re going: the promise of Building43 is bigger than just being a WordPress blog with a friendfeed group or a Facebook page. The promise is we can help other people and businesses get excited about the Web we love. That’s why, in today’s live video stream on Kyte.tv (we will start at about 4 p.m. Pacific Time) that we’ll be doing from TechCrunch’s headquarters in Palo Alto we’ll be asking you to help teach someone else about how to do something on the web. Over the next few weeks we’ll have people teaching about building large-scale databases with Hadoop, how to speed up your Web app, how to build an iPhone prototype, how to do copy-and-paste programming so you can add a cool widget to your website like the ones I have along the right edge of my blog, or many other topics. See, if we let businesses just stay in the 1994 web, we’re all missing out. That’s like what my blog has been lately. Not updated. Not interesting. And leaving business on the table. Yeah, I’ll be doing my usual thing of getting you inside to see how companies are using the Internet in a new way. Some of our first interviews are with Four Seasons, Zappos, Facebook, Google. We’ll also have conversations with some of the smartest minds and visionaries. One of the ones that you’ll see today is with Fred Wilson, the guy who invested in Twitter, among many other companies. That’s all fairly interesting stuff, but if Building43 is just about me, it’ll be a failure. It won’t have reached its potential. Here’s another way to put it. When you look at Techmeme and see all the tech bloggers yammering on about the latest cool things, the way they were this week about Facebook’s new URLs that are coming out tomorrow, or Apple’s new iPhone, do they look backward and think about the average businessperson? Not in my experience. We don’t have an industry conversation about how to actually use all this cool stuff to improve lives, make businesses stronger and closer to their customers, and have some fun. I see Tim O’Reilly and Craig Newmark working behind the scenes with technologists and politicians inside the government to try to get them onto the modern web. That’s a huge job because many parts of government are still run with paper, not with computers. Of course that means they can jump right over the 1970s, 1980s, 1990s, and land squarely in 2010 with some interesting new approaches that many businesses will struggle with because many businesses assume that having a 1994 website is good enough. Those are our challenges, but also our opportunities. We’d love your help! Invite us over and we’ll help you teach the world to make a better Web for all of us. Q: When will it turn on? A: At about 5 p.m. Pacific Time this afternoon. A: A whole bunch of people at Rackspace and elsewhere, from designers, to executives. I haven’t had my coffee yet, so don’t want to leave anyone out, but we’ll have an about page on the site where we’ll talk about the team. One person I wanted to thank, though, is Tricia Macmanus. She’s on loan to our team from inside Rackspace and without her this wouldn’t have shipped. Q: Why are you launching with a private, by invite-only, party at TechCrunch tonight? Q: What is Rackspace’s involvement? A: Rackers and Rackspace are providing the hosting, the team to build the site, the team to get content, and such. You won’t see a logo on there, nor will you see much, if anything at all about Rackspace on the site. Q: If Rackspace is paying your salaries and for all your equipment, why aren’t you talking about them? A: For Rackspace Building43 is an R&D group. It’s how Rackspace is learning what it should do next. We’re meeting with the most bleeding edge companies and we’re trying to learn and share those learnings with everyone. When we visited Zappos that company learns by hosting public tours where other companies come in and have conversations with executives (you get to see part of one of those conversations this afternoon as you sit at the table with Tony Hsieh, CEO of Zappos, and Graham Weston, chairman of Rackspace). But not every company is like Zappos, and we’re just exploring the world looking at what’s happening on the Web right now. Q: I was expecting to see more of a place where we can build and try Rackspace’s new cloud hosting services. A: One step at a time, we’re just getting started and we’re now evaluating what to do with the next phase of Building43. Q: How often will new content show up from the Building43 team? A: We have a ton of videos still to edit and get up, you should expect at least a couple every week to get started, but it’s our goal to get one a day up. It might take a few weeks to ramp up to that level because we’re still building the team and Rocky and I are traveling a lot, we’ll be in New York next week, for instance, and London in early July. Q: How do I submit a video or a blog? A: There are a lot of ways you can contribute to Building43. You can tag someone else’s videos with “building43” over on YouTube and those will show up on the site. You can include the #building43 hashtag in your Tweets and those will show up in the Twitter parts of the site. Or you can post to the Building43 Room on friendfeed. Q: Why are you so fanatical about friendfeed? I thought you worked for Rackspace? A: Friendfeed has the best real time display right now of any of the services you’ll find us on. It also has the best room technology and the best community (we made a list of more than 500 innovators and influencers and most of them are on friendfeed already). Plus we just like the team and they even, over the weekend, wrote some custom code for us so that we could better integrate it into our site. Q: Doesn’t “fanatical” imply this is going to be a cult? Q: Since anyone can post to Twitter or friendfeed aren’t you worried that spammers and jerks will show up? A: I’m sure there will be those who test the limits and have some fun. Heck, we might even do that ourselves! But they’ll get bored quickly and move onto something else, which will leave the rest of us to work together to make the Web better. Q: I saw that you have some cool T-shirts and stickers, how do I get one of those? A: Stay tuned, we’re still figuring out how to distribute those. Any other questions? I’ll try to answer them on friendfeed, here’s a thread started about this post already, so join into the Building43 room. UPDATE: Lew Moorman, Rackspace’s President, posted here about his views on Building43.